Han Solo is not only one of the most popular heroes in Star Wars, but also a playable character in Star Wars Battlefront, an online shooter from EA. In our Hero Guide to Han Solo, we will show you how you can take the role of gunslinger and how he uses his skills in the fight perfectly. In addition to his buddy Luke Skywalker and his great love Leia, Han Solo is one of three playable heroes on rebel side. Some game modes let you take on the role of the smuggler right from the start, while in others you have to find the right hero power-up. You can use Han Solo as playable character in the following game modes. Hero Battles: Selectable on the rebel side from the beginning. 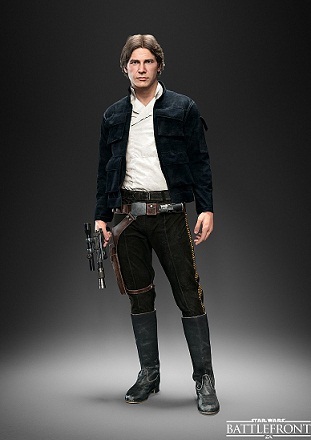 Hero Hunt: Here Han Solo is one of the hunted hero who can be assigned to you from the beginning. Heroes vs. Villains: Playable on the rebel side. Hegemony: Can be found on rebel side as a hero-power-up. Walker Assault: Can be found on rebel side as a hero-power-up. - DL-44: This gun is not only the strongest Blaster, but its also Solo’s standard weapon. This can effectively destroy your enemies. With the alternate fire button you can zoom to better aim. - Evasive Roll: Han Solo is agile and can roll away laterally when you use the appropriate key for crouch left or right. - Shoulder Attack: It is a type Dash attack, he carries forward and thus knocks down opponents in front of him. Ideally use in corridors, but can also be used to escape from sticky situations. - Rapid Fire: Without overheating of weapon you can maintain an insane rate of fire with rapid-fire for a limited time. - Lucky Shot: A charged shot that inflicts a lot of damage. Ideally, you use it against a vehicle or other heroes. - Han Solo has no active defense as Luke, Darth Vader or the Emperor. You must therefore evade attacks. - Only Boba Fett can be really dangerous, so try to catch him with Lucky Strike and dribble past his missiles. - Han Solo does not need support and can handle well the enemy lines and take care in the hinterland for mischief. - Since you cannot negate damage, you should be careful that you may not enter into the crossfire. If this does happen, enabled rapid-fire pops and take all enemies as quickly as possible. - If necessary, you can also use the shoulder attack to escape quickly.